Be Cool or Stay Hot. EcoFriendly – Love your Mother. ErgoFriendly – Get a grip. Reusable-Recyclable-Biodegradable. Inked with water colors. The Spring festival season is right around the corner. Perfect time to talk about an alternative to neoprene beverage holders. 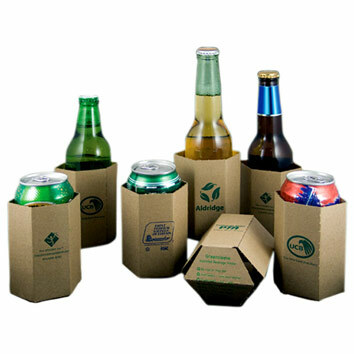 The Greensleeve Insulated Beverage Holder is a USA Made cardboard coolie that Valley Castings likes to say is, “Made in America by Americans with American Garbage”. These Recycled Insulated Beverage Holders are made from 69% post consumer waste, and printed with an earth friendly water based ink. They cost as low as $0.49 per unit, and that unit price includes a one color – one location imprint. The imprint size is 1.5″ x 1.5″. If you are interested in the Greensleeve Insulated Beverage Holders to promote your own business, or to get a sample, email info@proformagreen.com for information and pricing.